The upcoming DreamHack Austin is truly a dream for many passionate gamers. Thanks to 1UpOnCancer, it’ll also be a chance to help adults fighting cancer. From April 28-30, gamers will be able to stop by booth #710 and give generously to help others continue to hold onto their own dreams. 1UpOnCancer is a nonprofit organization that strives to provide financial assistance for adults fighting cancer. Founded in 2015 after Nintendo’s president and CEO Satoru Iwata passed away from cancer, the group is largely comprised of gamers and focuses upon the gaming community. 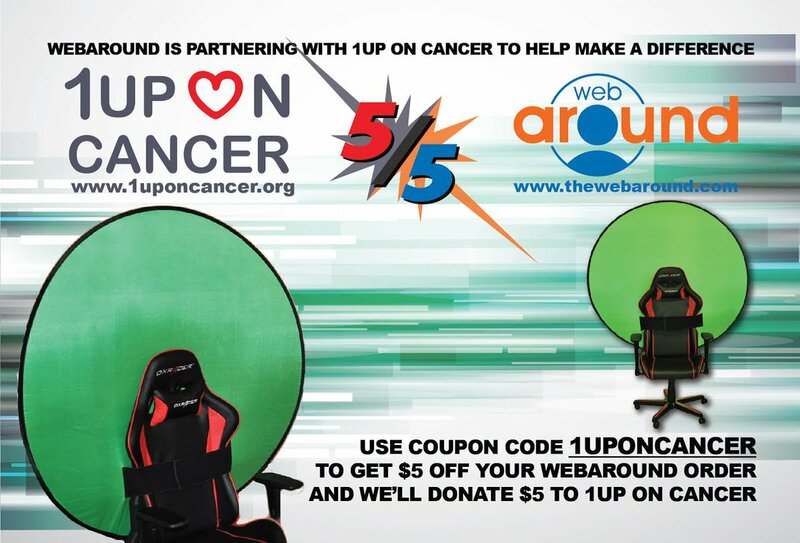 Thanks to the generosity of DXRacer, gamers who stop by the 1UpOnCancer booth will be able to enter the silent auction for a DX Racer gaming chair and WebAround. Unlike most conventional chairs, this model has a higher backrest to support your entire spinal column. There’s also a headrest pillow, conventional tilt mechanism and strong mesh material, all contributing to a better gaming experience. The winner will also receive a 56” The Big Shot Green Screen Webaround, allowing gamers using webcams to control their backdrop. The portable screen will fit most regular chairs as well. Considered the world’s largest digital festival, DreamHack includes esports, PC LAN parties, console, tabletop, cosplay, gaming, hackathons and questing, as well as live music. DreamHack Austin will feature performances by Magic Sword, Mega Ran and Grimecraft on Friday, and Varien, Mr FijiWiji and Fractal on Saturday. Attendees will also be able to choose from a wide variety of interactive panels over the three-day festival, including “Breaking into an Esports Career: How to Thrive in Your Dream Job”; “Japanese Street Fashion Q & A”; “Podcasting 101”; and “Women in Geek Girl Media”. DreamHack Austin 2017 will be held at the Austin Convention Center, 500 E Cesar Chavez St. in Austin. For more information, visit austin.dreamhack.com/17 or www.1uponcancer.org. Thank You Everyone at RTX 2016! We just wanted to give a big thanks to everyone who donated during RTX 2016! We raised exactly $1,000! Thank you for an awesome RTX. Up next is QuakeCon! Looking to help others while playing some games this weekend? 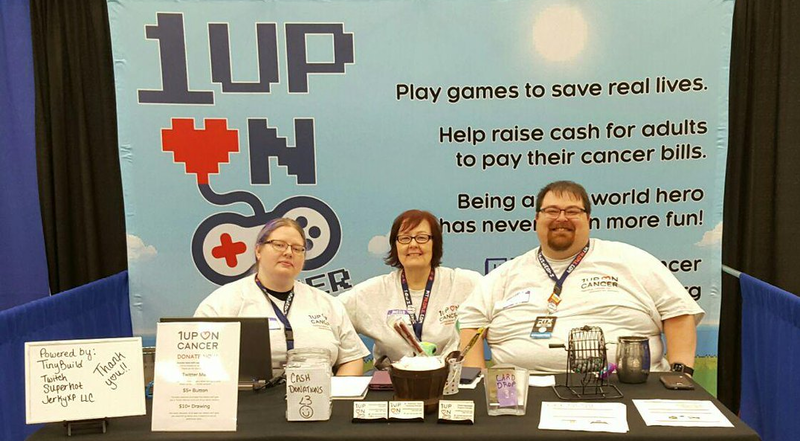 Why not host a charity stream for 1UpOnCancer? We’re doing a seasonal push to raise money to help bring in the warm weather. Our goal is to finish off the quarter in a huge way. 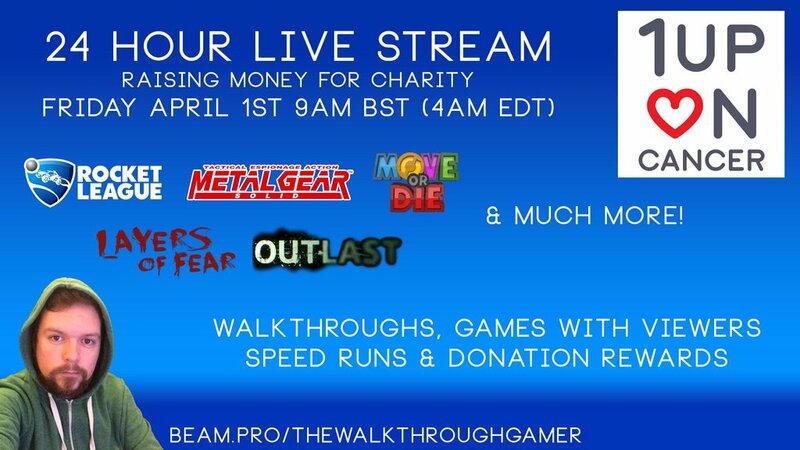 Doing a stream for us is easy, just check out our page Charity Streaming 101 for information. Don’t fret if you’re not a streamer and still want to help! We could use your help spreading our message on our Twitter and Facebook pages as well as coming and joining in on the fun on the many streams happening this weekend. 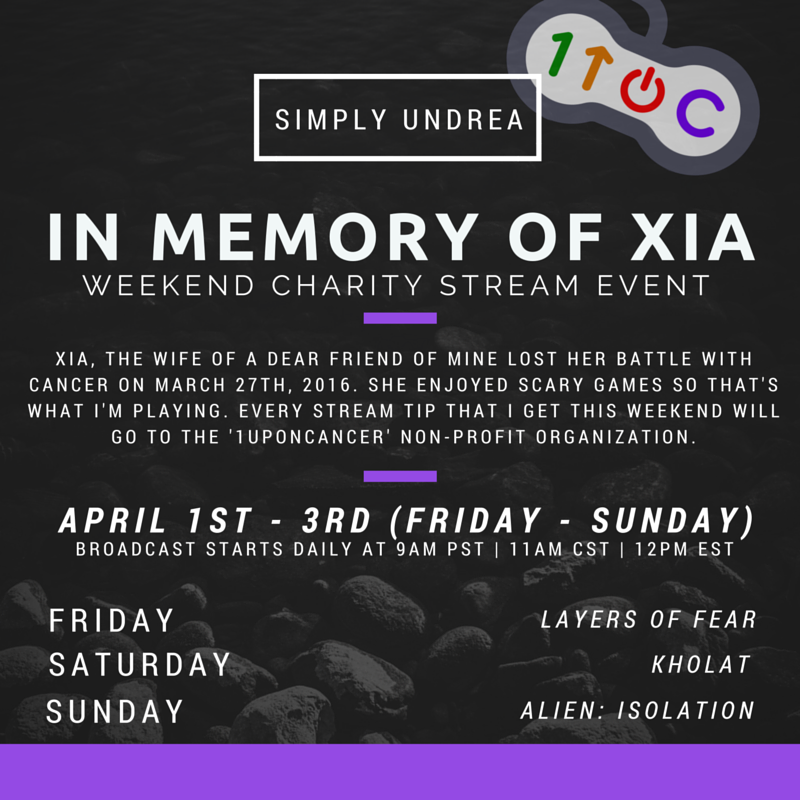 Our 1UpOnCancer Twitch will be busy all weekend with live events and hosts. 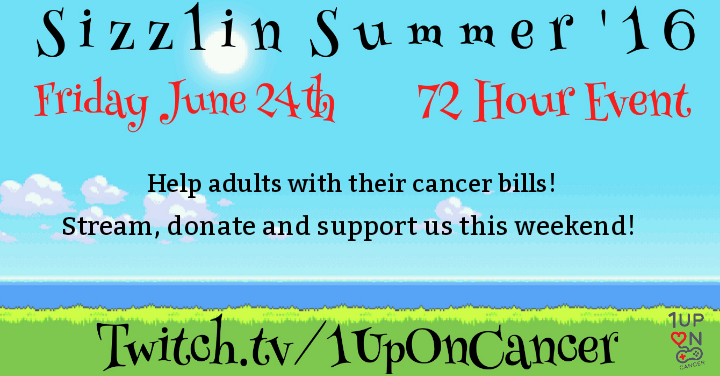 1UpOnCancer’s 30 Hours of Sizzling Summer ’16: Friday starting at 6pm PT for 30 hours on our Twitch channel. 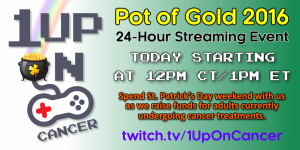 Gallant Gamers inaugural event for 1UpOnCancer: Sunday at 12pm PT to 12am PT. Come help us raise a lot of money for adults with Cancer! We’re officially a partner of Twitch as of June. 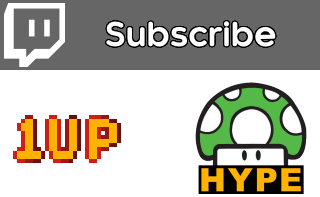 We have really sweet looking emotes if you subscribe too! 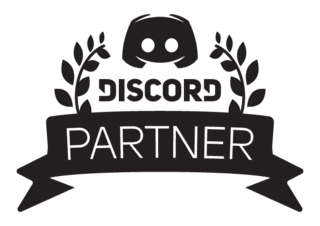 We’re officially a partner with Discord as of today! Join our Discord server! This is one to watch after you get home from work but this is quite funny, this is a variant of Apples to Apples but you grab passages from books for answers. Our toast happens just after the 6 minute mark. Thanks everyone at Blame Society Productions! Pot of Gold 2016 – Thank You! Before I start this post I want to thank each and every one of you who volunteered, donated and helped in any way possible to make our event a success. It means a lot to all of us here at 1UpOnCancer that you believe in our organization and want us to succeed. We wrapped up Pot of Gold 2016 just after noon yesterday and immediately I went to bed, I was up for 27 hours and was extremely tired. Our first 24-Hour event was a huge success, we raised $2,186. We want to do this again soon, we’ll have to see when we can. Again, thank you very much from all of us at 1UpOnCancer! Pot of Gold 2016 Starts Today!